In November 2014, the Greater Naples community voted to create the Greater Naples Fire Rescue District by bringing together the Fire Districts of East Naples and Golden Gate. This decision offered a tremendous opportunity for the fire service to create a comprehensive operational and financial approach to the way that it provides the community with fire and medical emergency response services and education. The leadership of the new Fire District recognized the need for a strategic plan that would incorporate the best vision and forward-thinking of the men and women whose services are essential to the District’s operations and future growth. To accomplish this, the District called upon 30 fire service professionals and community leaders whose opinions and recommendations would help shape and focus the new strategic plan. Working with an experienced strategic planning consultant from January through April 2015, this group has articulated the Mission, Vision, Values, and Strategies that will make the Greater Naples Fire Rescue District strong. 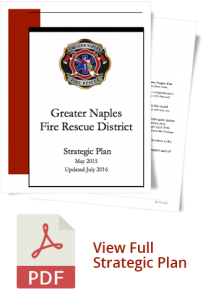 The Greater Naples Fire Rescue District Strategic Plan was affirmed by the members of the Board of Fire Commission at its meeting on May 12, 2015. The District will now move to create the operational and tactical plans that will support each of the strategies and goals that are outlined in the Strategic Plan.